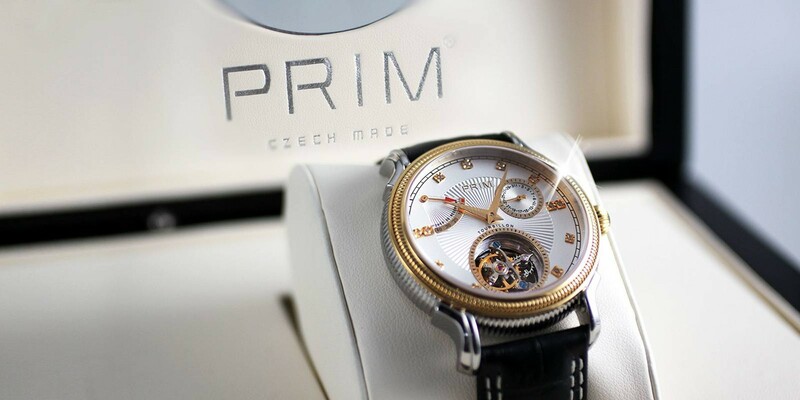 Exclusive limited edition PRIM Tourbillon are watches, in which for the first time in the history of the Czech brand PRIM, we used a mechanical movement with royal watch complication called flying tourbillon. 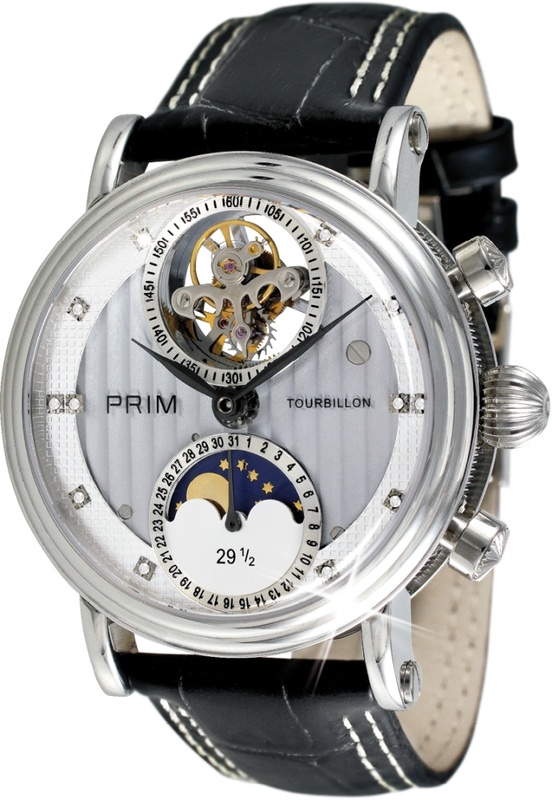 The PRIM Tourbillon T. G. M. and PRIM Tourbillon Comenius watches are provided with a 316L stainless steel case made with high precision and high gloss finish. 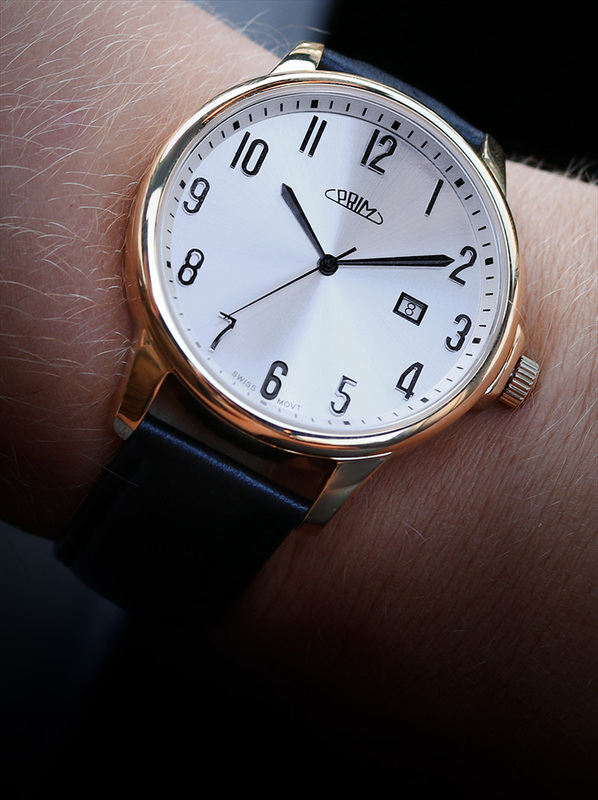 Toubillon – the royalty of watchmaking complications. This is a mechanism that compensates for the influence of gravity on the accuracy of watch movements. It is a mechanical anchor mechanism, located inside a movable platform with centralized inertia, which rotates around its own axis once a minute, thereby providing a change in the position of the flywheel relative to the Earth’s core. 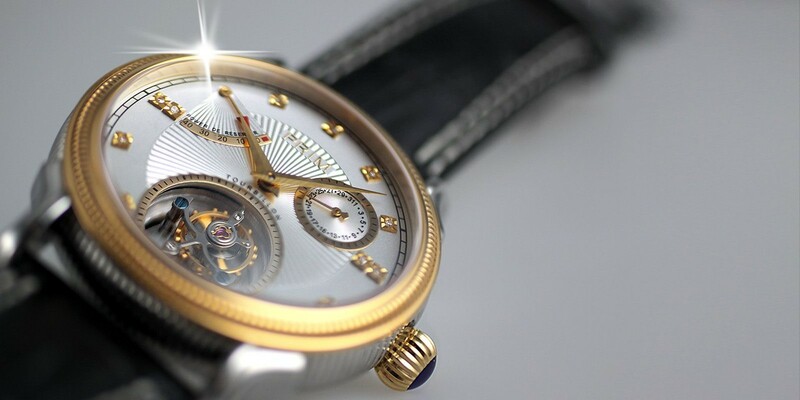 This is one of the “high” clockwork complications of so-called Haute Horlogerie. It was invented by A.L. Breguet in 1795. Tourbillon watches are only offered by high-quality watch brands, and are indicative of the brand’s standards. Do you remember the great man of Czech history, educated man, intimately connected with the soul of a nation with a sense for inner genuineness and manner. T. G. Masaryk believes in the law equal for all regardless race, nationality, gender or social status. Therefore, the idea of democracy is linked with human and social considerations. These ideals gave into reborn Czechoslovakia state. 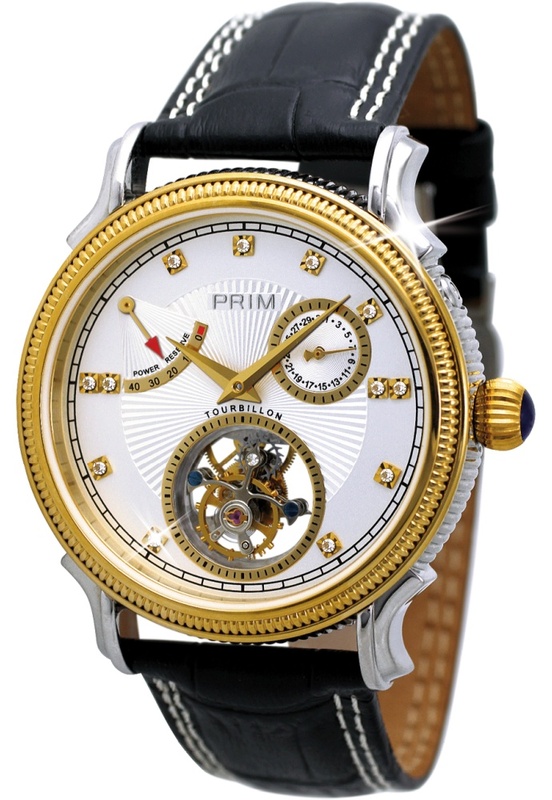 These luxury watches PRIM Tourbillon Comenius were made in honor of the famous scholar J. A. Comenius. Jan Amos Comenius is one of the most legendary Czechs (Moravians) who despite the bad times of life could face the obstacles. Throughout Comenius life he sought to reform education, reform of society and the peaceful solutions of religious conflicts in Europe. 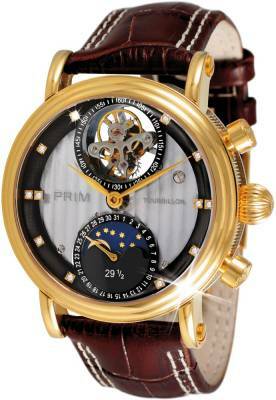 PRIM Tourbillon T.G.M. 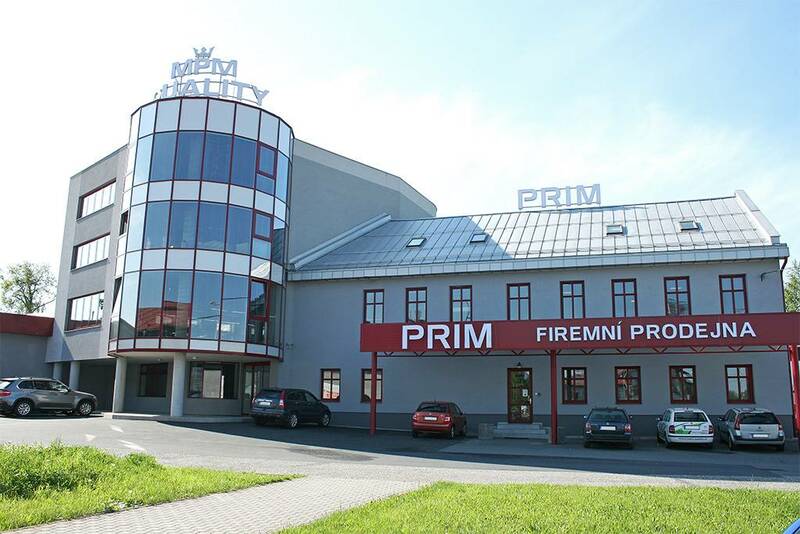 are watches, in which for the first time in the history of the Czech brand PRIM, we used a mechanical movement with royal watch complication called flying tourbillon. 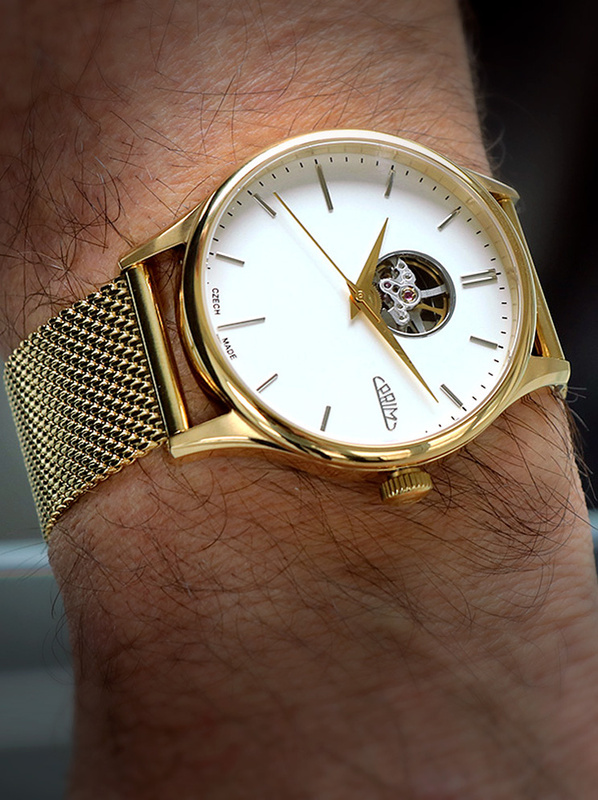 Tourbillon is mechanism that rotates around its own axis once a minute. A tourbillon aims to counter the effects of gravity by mounting the escapement and balance wheel in a rotating cage, to negate the effect of gravity when the timepiece is stuck in a certain position. 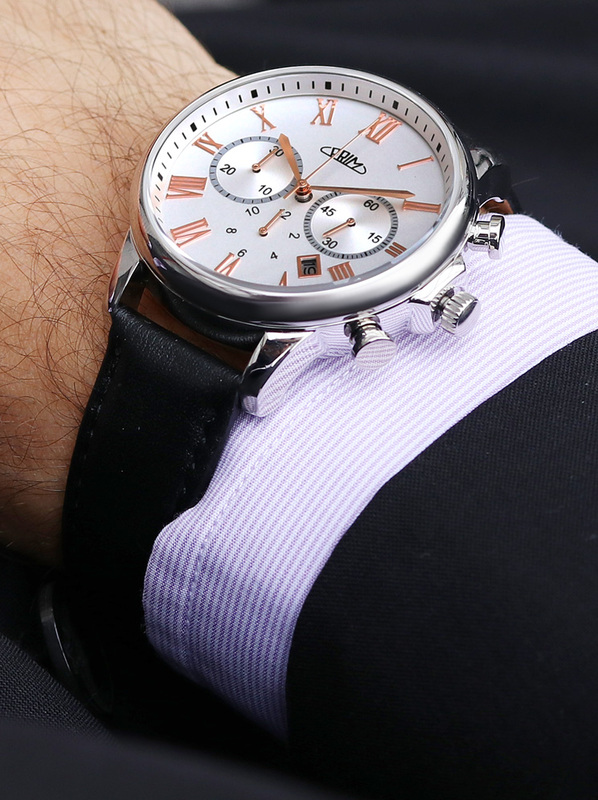 Movement has function of power reserve and date. 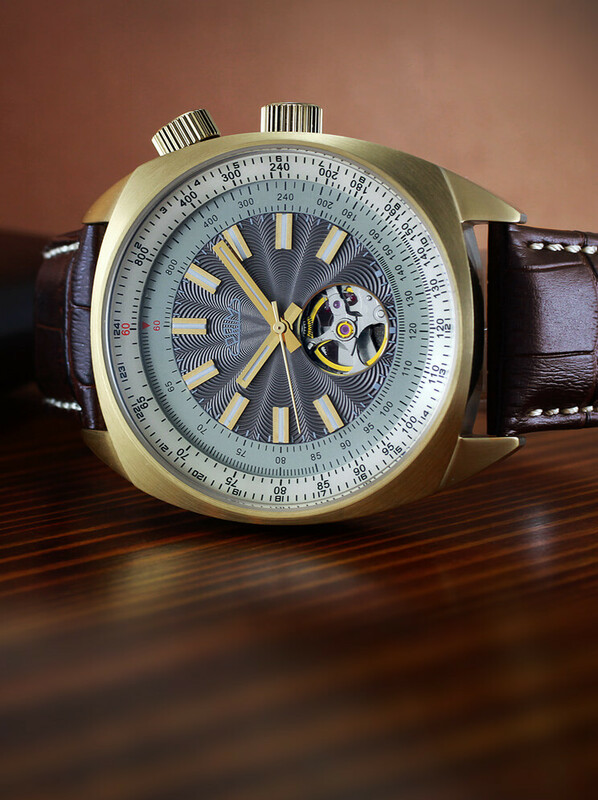 The dial is decorated with embossed surface and indexes with 12 diamonds. 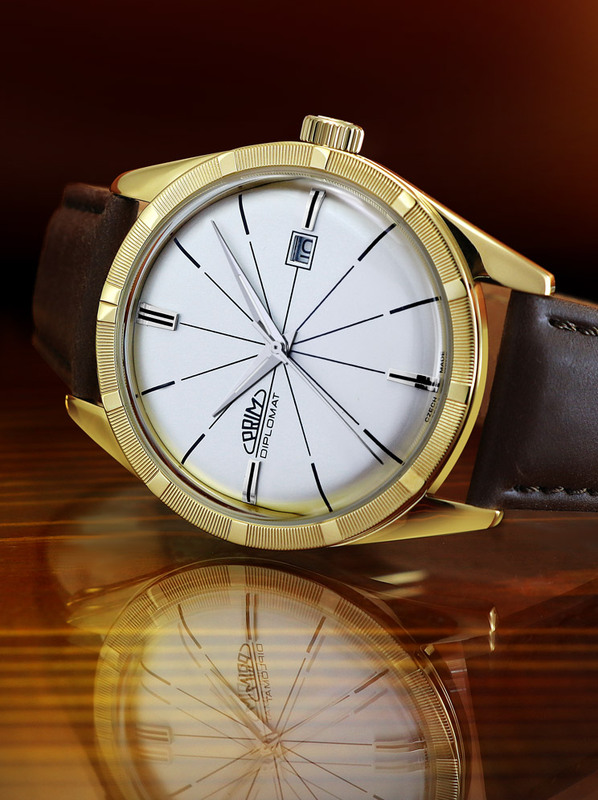 Watch case is made of stainless steel 316L, gold-plated by method IPG (it is new method used shortly in the watchmaking industry, its far more durable than gold-plating methods used so far), convex sapphire glass scratch resistant, stainless steel (316L) crown with transparent mineral glass, water resistance 3 ATM, leather strap completed with a double clasp called „butterfly clasp“. 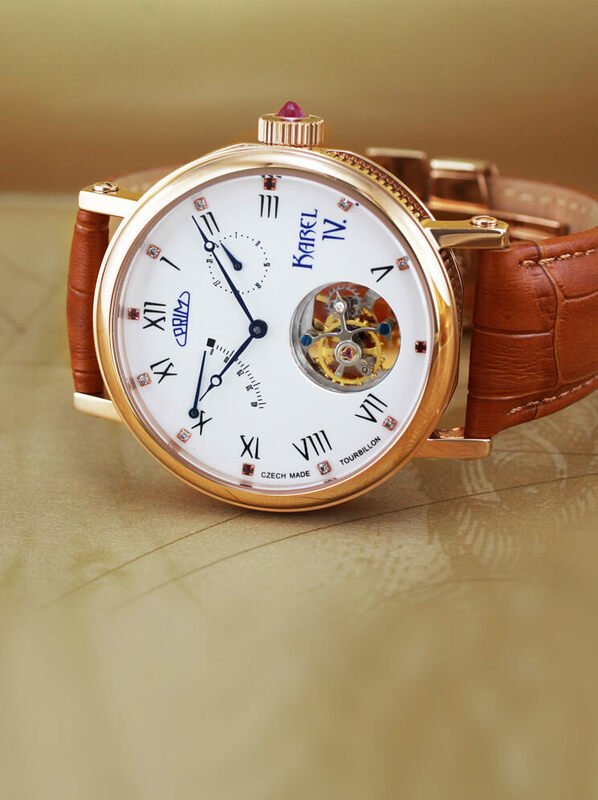 This luxury watches are supplied with a warranty certificate in a highly polished wooden box. 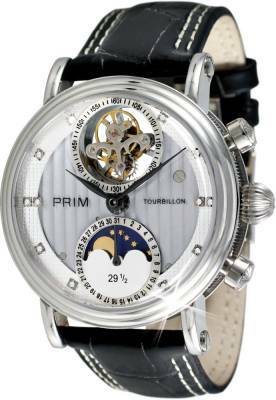 PRIM Tourbillon Comenius are made of stainless steel 316L modified subsequent polishing. 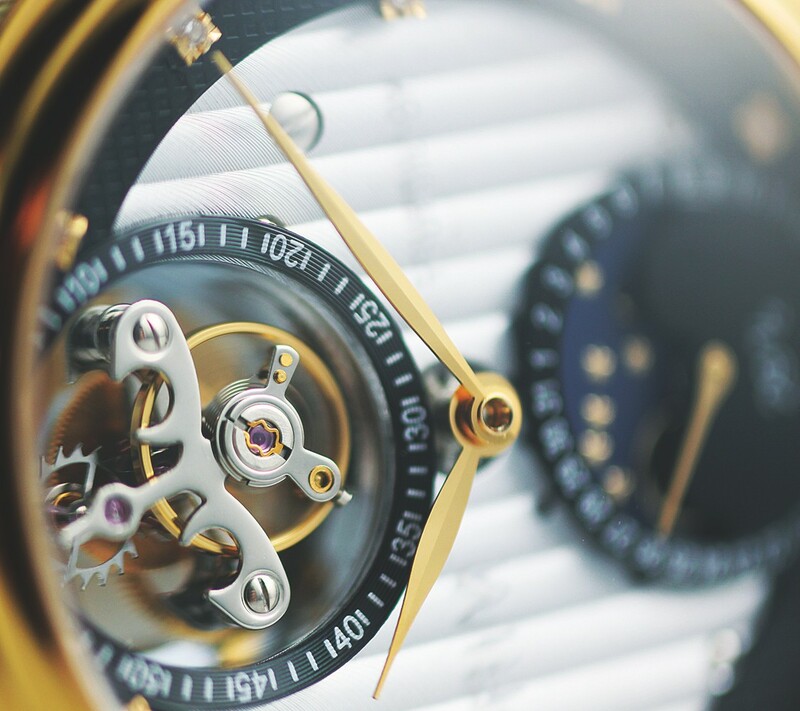 The dial with aperture reveals royal watchmaker complication called tourbillon. 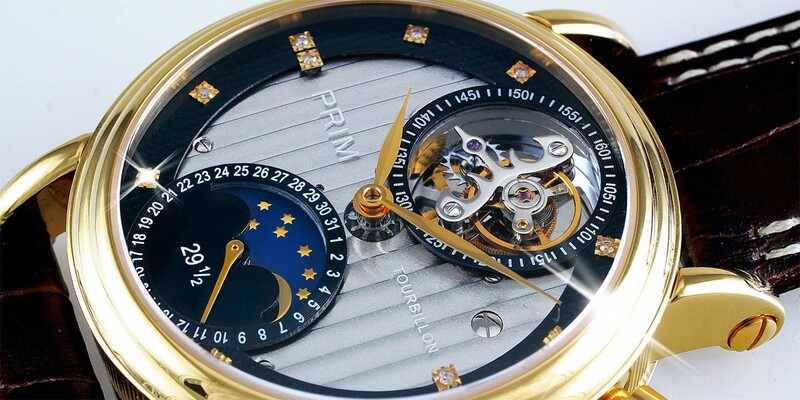 Around the perimeter of the dial there is set of 12 cut diamonds. 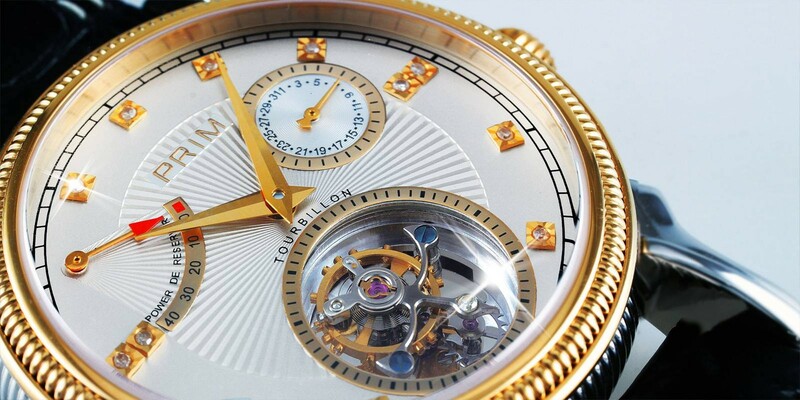 At the 12 o’clock position the tourbillon rotates and also it have function of the second/minute hand. At 6 o’clock position there is placed in a circular counter date with hand (mechanism) and below its showing the lunar phase. 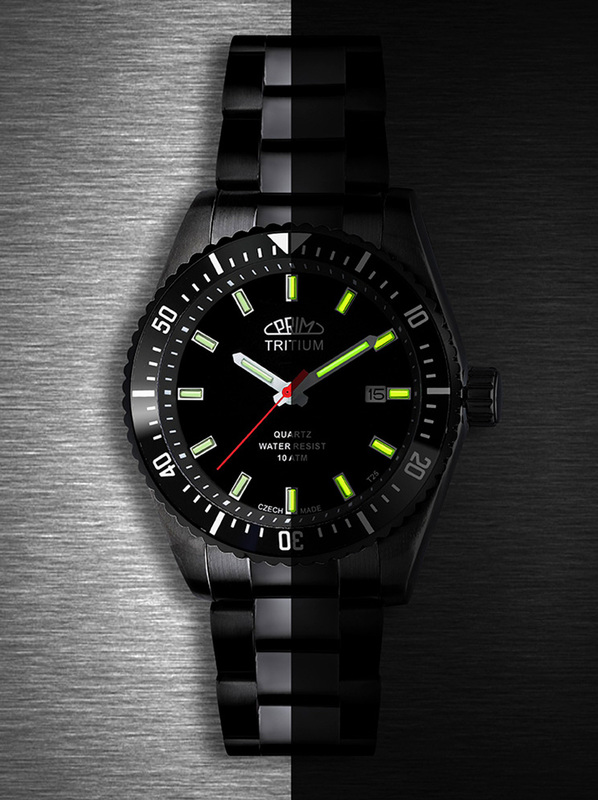 The watch has convex sapphire glass, which is highly resistant to scratches. Glid case of this model is made with very resistant method IPG. 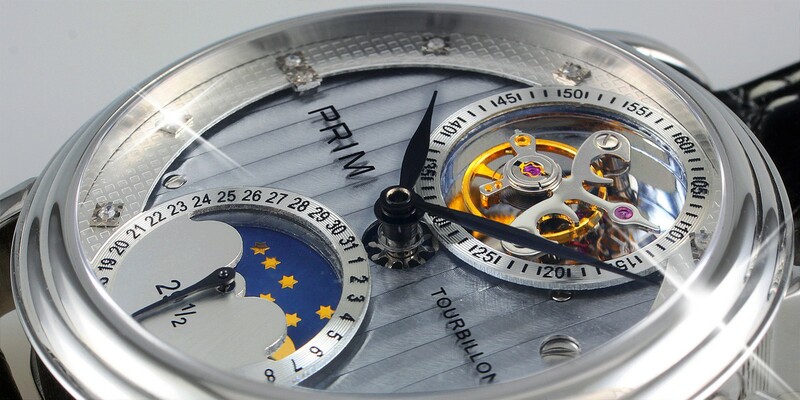 The whole mechanism is closed with transparent mineral glass, around which is a brief description of the model along with the serial number. Those luxury watches are supplied with a warranty certificate in a highly polished wooden box. 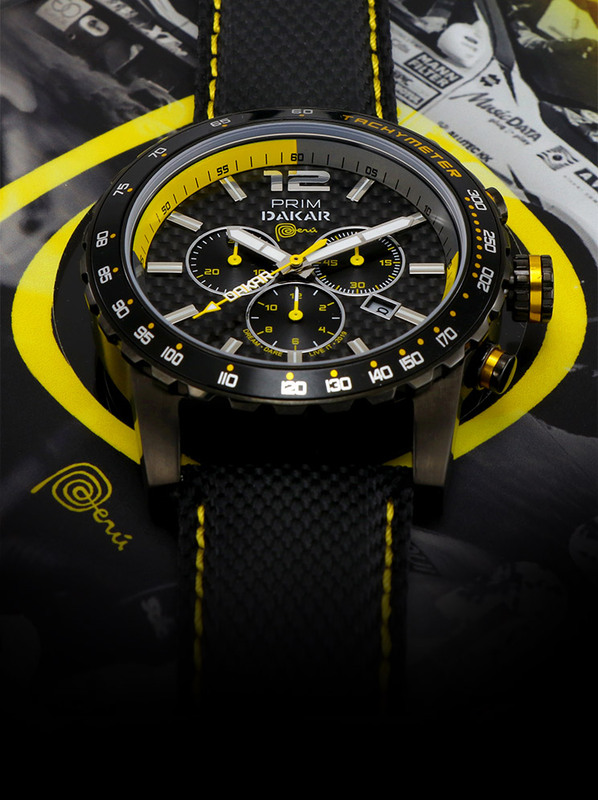 The watch has convex sapphire glass, which is highly resistant to scratches. 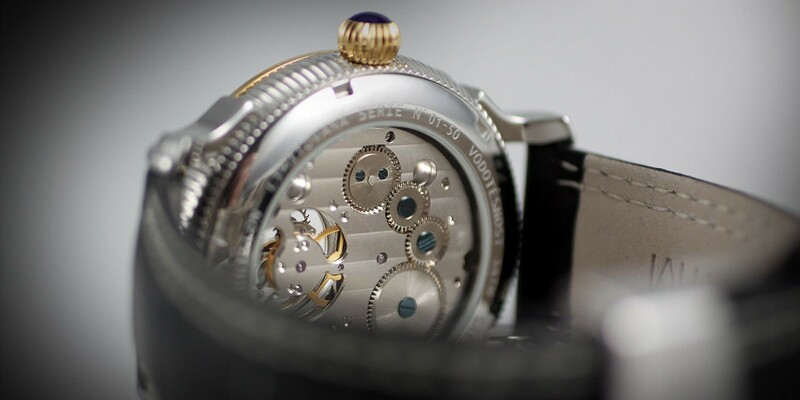 The whole mechanism is closed with transparent mineral glass, around which is a brief description of the model along with the serial number. Those luxury watches are supplied with a warranty certificate in a highly polished wooden box. Watches from the limited collection of PRIM Tourbillon T. G. M. & Comenius were made in limited series of 50 pieces. The models are already sold out.